This time, the selection of works from the UGM Collection focuses on the street, more precisely on the streets of Maribor, as artists living in Maribor have captured them in various media over the past century. 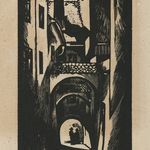 These works lead through the history of Maribor and at the same time through different visual approaches to depicting streets and the city, ranging from dramatic views and idealised bourgeois traditions through rough photographic realism to engaging new media. The following four accentuations are presented in chronological order. 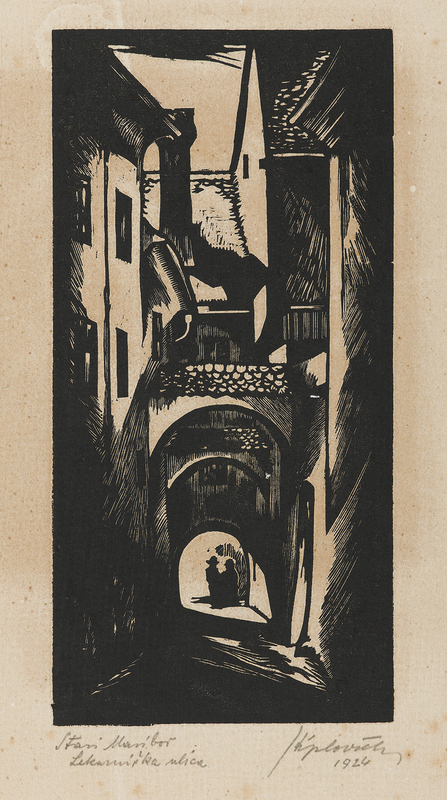 In the 1920s, Franjo Stiplovšek portrayed pre-industrial Maribor, the streets of the old town, and the transitions between Glavni trg (Main Square) and the Drava River in woodblock printing. The vertical format emphasises the narrowings of the road, while woodcuts in expressionist style allow the pictorial field to be sharply divided into contrasting black and white flat areas. Despite the expressionist touch, however, one cannot say that the artist in depicting the street drew attention to imminent danger or mental decay, in the motif he rather recognised the dramatic romanticism of the streets that have been gradually shaped over the centuries. 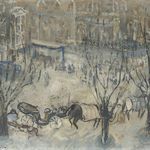 Painter Zoran Mušič was active as an artist in Maribor in the years before World War II, after completing his studies in Zagreb from where he brought some Parisian painting features typical of the Zagreb School of the time. He depicted squares and streets of the city that were characterised by the bourgeois atmosphere of the late 1930s from an upper perspective. 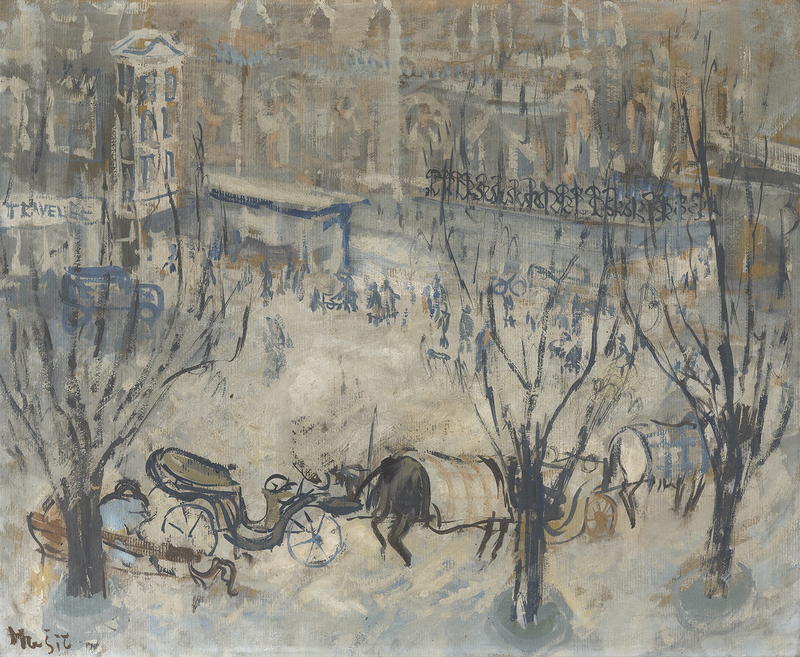 Mušič's streets are denoted by a master painterly stroke in silvery shades of blue, which made him stand out as an extraordinary painter already at the beginning of his career. By painting outdoors, Mušič shaped the street by its own presence and established himself in the city as an interesting painter personality. 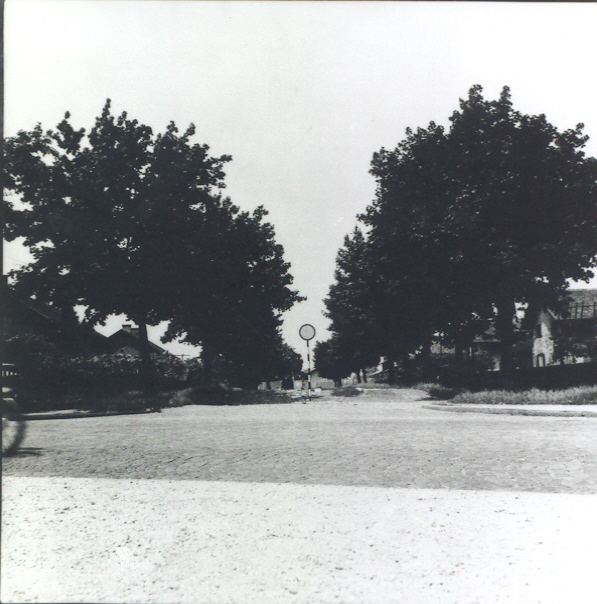 In the early seventies, Maribor photographers emerged from the Maribor Photo Club and briefly gathered in a formation called the Maribor Circle. 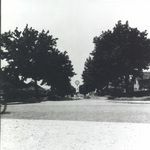 In their black-and-white photographs in medium format, usually mounted on fibreboard, they often portrayed the street. The suburbs, as naked reality pared of all the superfluous and the peripheral, as well as scenes of everyday life have been at the centre of their interest. A modern approach to photography, which does not convey beautiful moments but requires the beholder to reflect upon it, was typical for them. 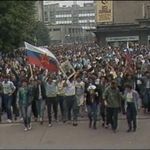 United in dark tonality, they presented the harsh reality of life in one of the most industrialised Yugoslav cities of the time. 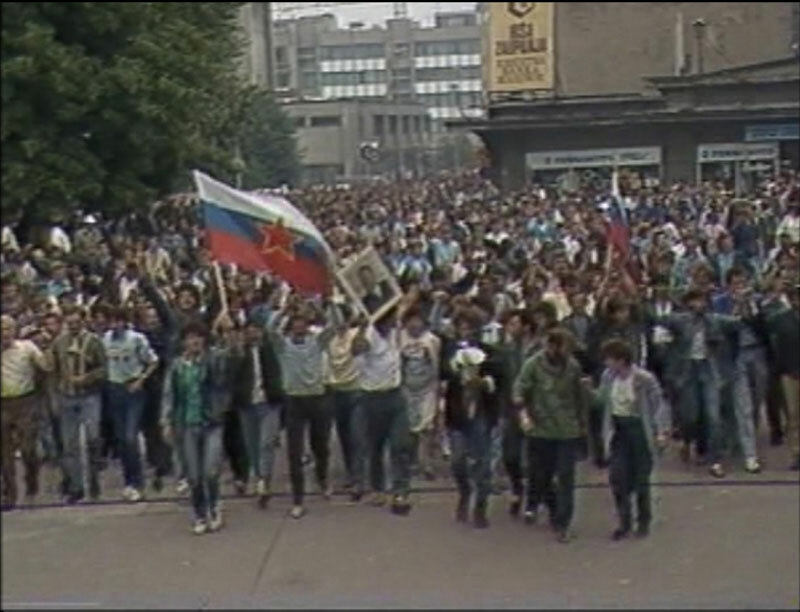 In a video, appropriating the form of a newsreel film, videographer Nika Autor looks back upon the last decades of the previous century, when Maribor experienced major political changes and the disintegration of industry as the driving force of its economy. The street is presented here as a place of rebellion and protest that have been delineating Maribor up to the present. Cabinet of curiosities, Kunstkabinett, Wunderkammer are words describing a space of passionate yet systematic collecting activity. The cabinet is a space, half private, half public, where one may contemplate in solitude, or a place of intellectual gathering. A collection of small treasures opens a doorway to poetic understandings of the world which surrounds us. The play of composition and a precise selection create stories of time, meaning, and passions for knowledge. The cabinet is where imagination comes to roam. The UGM Collection contains over 5,000 artworks including all forms of visual art and representing the highlights of Slovenian fine arts. Represented in this collection are leading exponents of modern and contemporary art, particularly from the regions of Štajerska, Koroška, and Prekmurje. The collected works range from the end of the 19th century to the present. The Maribor Art Gallery (UGM) has been running the first collection of video art in Slovenia since 1999. With its systematic compilation of the most important works of prominent Slovenian video artists, the gallery has created a collection that has become a reference point in the national and international arena, being one of the most active international players in this field. In 2009, we have enlarged the photographic collection by 140 photographs from the Maribor Circle − Maribor's avant-garde group of photographers from the 1970s − and by a donation of over 900 photographs by Maribor photographer Janko Andrej Jelnikar. In 2015, Maribor Art Gallery acquired 100 works by Ivan Dvoršak with the help of the Ministry of Culture, while the remaining legacy was donated. In 2017, Stojan Kerbler donated to the gallery 100 of his own excellent black-and-white photographs mounted on fibreboard, including the famous series Pig Slaughter and Haloze Cycle. In 2017, the Ministry of Culture supported the acquisition of 100 photographs by Zora Plešnar, while the photographer donated the rest of the oeuvre without the negatives. Due to shortage of space, the works from the UGM Collection cannot be permanently exhibited on a larger, transparent scale. While Maribor Art Gallery continues to fight for better working conditions, the UGM Kabinet, however, by occasional periodic selections of works from the Collection offers visitors a chance to get acquainted with them. The UGM Collection deserves a permanent presentation that will accomplish its potential as a reference point for education, research, inspiration, socialising, and empowerment.